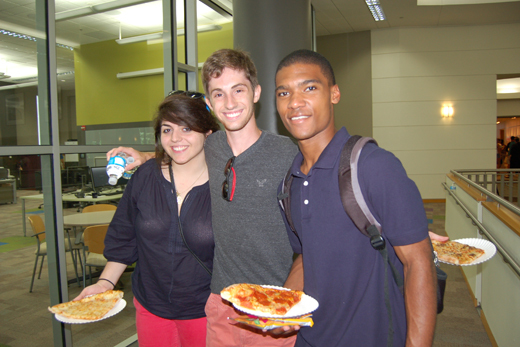 New Emory students enjoy the Robert W. Woodruff Library’s welcome lunch and tour in a previous year. Photo by Emory Libraries. The Robert W. Woodruff Library will welcome Emory University’s 1,400 new students on Aug. 25 with an orientation party and tours to acquaint them with the library’s essential resources and services. The library lunch party will take place on the fourth day of new student orientation, which is led by the Emory College of Arts and Sciences orientation team. The event will be held on the third floor, in the Jones Room and in the Learning Commons across from the Emory Center for Digital Scholarship (ECDS). Mooney says her team will order 240 pizzas – for a total of 1,920 slices – as well as other snacks for those who don’t want pizza, including gluten-free options such as protein and nut and fruit bars. Before the party, orientation leaders will give new students tours of the library, noting the service desk and self-checkout, collaborative and quiet study areas, printing hubs, group study rooms, the Music & Media Library and other services and resources. Students will be back in the library later in the semester for an assignment for their PACE (Pre-Major Advising Connections at Emory) class, a requirement for first-year students, which in part helps them adjust to university coursework. The class has a library component that introduces students to using Emory library resources for research. Assignments include finding an article in the New York Times published on the student’s date of birth, locating an article in a scholarly journal, and using Library Simplified, the Emory Libraries’ DIY research help page, to find primary resource tools.